A number of years ago, my husband and I backpacked through Ecuador on our honeymoon. We biked through small mountainside communities, often villages where only a handful of tourists had ever been seen. Everywhere we went, I stuck out like a sore thumb. At six foot even, I towered over everyone we met. My husband, who is only five foot ten, was given numerous high-fives for “landing a grandé gringa.” People would laugh and point and not so surreptitiously take photographs. In my travels through East Africa, Asia, and India, there have been many times when I stood out. I mean really stood out. In each instance, sometimes I have felt uncomfortable, sometimes ill at ease, and a time or two downright comical. But in each of those moments, I knew the feeling would pass, and before long, I would be bound for home. Tucked back inside my East Coast world, I could blend in with everyone else. I could inconspicuously slip through markets and stores. No one would even raise a head or bat an eyelash when I entered a restaurant or a café. It is the luxury of being the predominant racial group in our corner of the world, and it is a luxury my children, adopted from China and India, will never have. Who I am and where I come from are questions many adoptees struggle with throughout their lives, but for most, it is an internal struggle. Children of transracial adoption have both the internal and the external struggle of identity because they look different from both their parents and often their immediate communities. Imagine for a moment what it would be like to grow up and never see another face that looks like yours, to be a square shape in a sea of triangles. This is the world in which many transracial adoptees live. The term transracial adoption refers to the adoption of one race or ethnicity by another race or ethnicity; for example, the Asian daughter of two white parents, the African-American son of a white mother, or the Indian sibling set in a family of three white sisters and brothers. As parents, we love and treat our children equally. We raise them in our own traditions and share our life experiences. When we look at our children, we simply see our children. No qualifiers. But the sad fact is, that is not how most of the world sees transracial adoptees, and it is not how many of them see themselves. This is why racial mirrors are important. The term “racial mirror” refers to mentors whose race “mirrors” that of a child whose race is different than his or her parent(s). In fact, the child may or may not be adopted, but racial mirrors are a key component in many transracial adoptions. 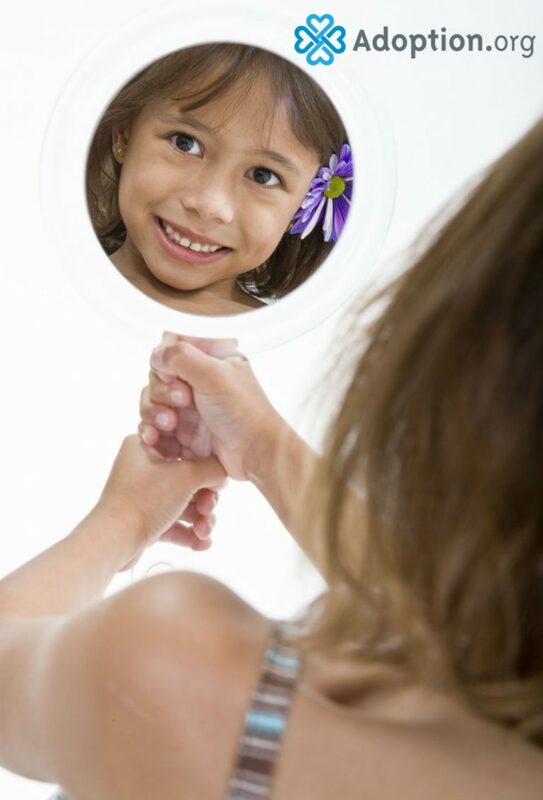 Racial mirrors allow children to identify and develop positive feelings about their race while looking up to people of the same race, and possibly ethnicity, as they are. For instance, an African-American child of two white parents might find a racial mirror in an African-American teacher or coach. Sometimes racial mirrors may come in the form of peers, but mentors are important as mentors give children insights and perspectives which are not always accessible from their peers. Racial mirrors are important because through them children can acknowledge and celebrate racial difference on their own terms, in their own time. One day when my son was little, I was standing in line for pick-up at my son’s preschool. It was the first nice day of spring and every child was sporting a sundress or a t-shirt. My son spotted me and lunged over to give me a hug. He then lifted his arm to mine and smiled, “Isn’t it funny I’m the only brown person here? All the kids think it’s funny.” I quickly surveyed my surroundings. His class of fellow two-year-olds looked like a promotional poster for “Visit Sweden!” All blond hair and blue eyed, my son’s was the only minority face in the whole school. A look at the teachers confirmed the same. There was not a single other race or ethnicity among them. I visited his school all the time, I went almost weekly for story hour, how had I not recognized this? To be fair, we were very careful about cultural inclusion. I had done a whole chapter on Chinese New Year with his class that January. We made lanterns and dumplings! But culture, it dawned on me, is not the same as race. The incident with my son got me thinking. In a mirror, we see our own reflections. Though we live in a diverse area, I will never know what it is like to move through my community as a minority. My son, adopted from China, and my daughter, adopted from India, will experience the world very differently than I do. In my home, and in our immediate neighborhood and circle of friends and family, my children are simply Jack and Mira. But outwardly people see an Asian and an Indian. Already in his short life with us, my son has experienced severe microaggression. He has experienced subtle, and not so subtle, racism. And he is only six. In each instance, we take the opportunity to talk, educate, and listen. In each confrontation, I ask my son how he would like to respond. And in each instance, it occurs to me that I will never fully understand. As the parent of two minority children, pursuing racial mirror mentors for my children means confronting my own privilege in the world. As a white woman and as a writer, I can empathize. I can try to walk in my children’s shoes. I can roleplay scenarios with them and try to navigate potential instances of bullying and microaggression, but I will never fully understand, and as a white man, my husband will never fully understand either. This is why racial mirrors are important. So what can we do? The first step is to find racial mirrors within your everyday family life. Think of what books you read with your children. Are there a variety of races represented? What about the people in positions of authority (teachers, policemen, principals) in the books? What race are they? Think about the movies you see. How are different races being portrayed? Are they the servants or the sidekicks or the main characters? What television shows do you watch as a family? “Fresh off the Boat,” is a favorite of ours, as it features a Chinese-American family navigating their way through life in Orlando, Florida. We love “The Mindy Show,” because it features a strong Indian woman, and we love “Blackish,” because they tackle issues of race in America. Of course, our children (ages 6 and 2) don’t necessarily watch them with us, but it’s important for them to glimpse what we are watching. For younger children, PBS shows like “Wild Kratts,” “Wordgirl,” and “Maya and Miguel” feature racial minorities in strong leads. Explore multicultural events in your area. Think of what music and dance classes your children might enjoy. Might there be racial mirrors there? In our area, I found an Indian dance school for my daughter and Mandarin is part of the standard curriculum at my son’s elementary school. We also have a very active adoption community around us with children both older and younger than my kids. Though not mentors, establishing and maintaining relationships with other transracial adoptees can help your children navigate the issues of racial identity they will face undoubtedly. The truth is racial mirrors can be found everywhere if you start to look. They can be soccer coaches, or teachers, babysitters, or even colleagues from work. I have a friend who works with a young Chinese woman, and we asked her if she might be interested in having a few sessions with our boys to learn more about China and what it’s like to be Chinese-American. Most importantly, get out of your own comfort zone. It can be intimidating to walk into a cultural fair or community center that is different from your own, but think about how your children might feel on a daily basis. Just as we teach our children to be kind, to read, and to look both ways before they cross the street, so too must we teach them about race. There is no question that the topic of race in America is a complex one, but we do a disservice to our transracial adoptive children when we choose to be color blind rather than color aware. And yes, it is complicated. As a transracial, transcultural, and transnational adoptive family, it is beyond complicated. This week I spent my afternoons stringing marigolds for Holi. As my daughter and I readied pots of color to throw during the spring festival, we talked about the beauty of India, the foods we would eat, and other spring traditions from her region of India. Throughout the year we find ways to promote her culture, along with my son’s. But we also work to promote race. After my son’s comment and subsequent experiences at his first preschool, I found and moved him to a new school with greater diversity. My daughter now attends this same school and I never hesitate at drop off. My daughter’s teachers are from Florida and Taiwan and her classroom is a beautiful rainbow. At two years old, she may not pick up on such small subtleties, but I know that everything I am doing and every choice I make will help both my daughter and my son as they navigate the difficult path of racial identity. Still worried about providing racial mirrors for your transracial adoptive children? Think about it this way. Every week I take my son to swimming lessons. It is not that I can’t swim (in fact, I had a brief stint in high-school doing synchronized swimming and diving, long story), but I am no expert in it. I can’t remember the exact swipe of the arm on the breaststroke. I can’t remember exactly how to do the butterfly. So my son takes swimming lessons. Each week we bundle up and head to the pool. I buy the equipment (the special goggles, the swim cap, the swim trunks) to give him the best tools I can. And I work to find an instructor. Some work well, others are just okay, and some are outstanding. But every coach helps my son navigate his time in the water. And when we do find that amazing instructor, my child dives in without fear and swims boldly to the other side of the pool and back. I sit there on the bleachers, smiling and proud. My son’s swim coach gave him something I could not, and for that, I am forever grateful. It also helps that his coach just happens to be Chinese-American. Coincidence? Not a chance. Have you had experience with racial mirrors? What have you done to find and promote racial mirrors in your family?